However, your K2 must be in something called the “MK-7” form. Your body absorbs this form better. Only something called the “MenaQ7® MK-7” form has been shown in a three year human study to help reverse arterial stiffness. 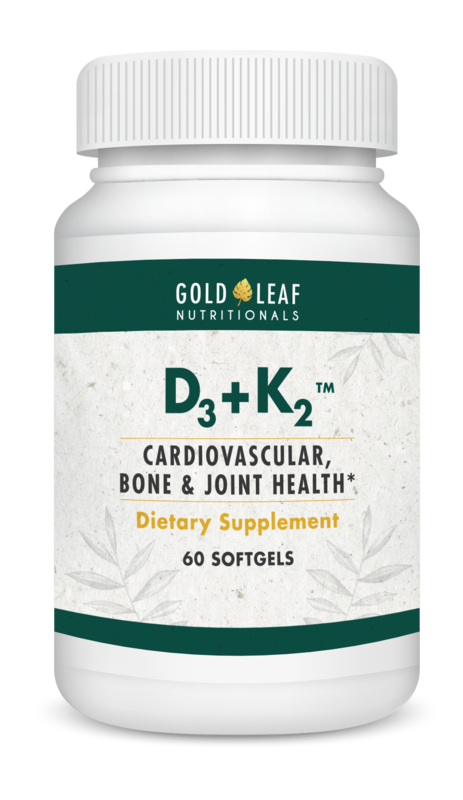 Gold Leaf Nutritionals’ D3+K2 is made with non-GMO ingredients and is also soy-free. Don’t miss out. Get this right now by clicking below. D3 and K2 work together to keep calcium away from your arteries and in your bones where it belongs. I’m sure you know how important calcium is for bone health. But here’s a surprising fact your doctor may not have told you: As you get older, your body gets worse at putting calcium in your bones where it belongs. So instead, it gets directed into your arteries. In order to help keep your arterial calcium at healthy levels, your body has its own natural defense called Matrix GLA Protein (or MGP) to guard them. But…your body must activate MGP in the first place…otherwise your arteries remain defenseless! What does this? Vitamin K2, which is the first nutrient in this combination. However, things don’t end there. The calcium must end up in bones where it belongs. For this to happen, your body needs something called osteocalcin to signal for your bones to absorb calcium and create new bone tissue. What’s crucial for creating osteocalcin? Vitamin D3, which is the second nutrient in this combination. That’s why you need a combination of K2 and D3. Your arteries stay more flexible and youthful…while your bones remain stronger! What are the quality standards Gold Leaf Nutritionals uses for their formulas, including D3+K2? We partner only with select supplement manufacturers who pass the most strict quality assurance standards to produce our high-quality products. Each manufacturer that we work with has been certified by either NSF or the Natural Products Association to ensure that they meet or exceed the FDA’s current Good Manufacturing Practices (cGMPs) for dietary supplements. We subject each product to a five-point inspection. First, all of the dietary ingredients in our products are tested for identification. That way, you know that what we put on the label is actually in the product. And finally, before any batch of product is released for distribution, we examine the product and review the product testing and certificates of analysis to ensure that it all meets our specifications. We also routinely send out our products for independent testing to ensure that the certificates of analysis from our manufacturers are accurate. We source the best ingredients from around the world and make all of our supplements right here in the USA. We make sure all of our ingredients are non-GMO and backed by solid scientific research. In fact, every claim and all of the research for our products have been reviewed by a strict marketing compliance team, to make sure we have the science to support our claims. Is there any soy or gluten in D3+K2? D3+K2 does not contain any soy or gluten-containing ingredients, though it is processed in a facility that may process soy or gluten. Is D3+K2 made in the USA? We source the best ingredients from around the world and make all of our supplements right here in the USA, in a GMP-certified facility. How should I use this product? How many tablets a day? We recommend 2 soft gels per day for maximum support. It is best to take with meals. If I have questions or am unsure about anything about D3+K2, can I speak to someone on the phone? Yes, your supply of D3+K2 is 100% protected by our no questions asked anytime guarantee. You have an unlimited amount of time to try it out. If at any time you’re not thrilled with your results, we’ll refund you every penny of the product price. "I will take D3+K2 for the rest of my life!" This could be your secret key to greater cardiovascular and bone health. D3+K2 is made with non-GMO ingredients and is soy-free. Take this opportunity NOW to discover just how fast this essential vitamin combo can help you feel more secure in your heart and bone health.